Have you uploaded all of your products to GSA Advantage? Do you have complete descriptions and photos on GSA Advantage? Is your pricing up-to-date on GSA Advantage? Have you uploaded your GSA Advantage Catalog? GSA Advantage! is the Federal Government’s premier online shopping superstore that provides a purchasing portal for federal agencies to acquire needed products and services. GSA Advantage! assures agencies that they are getting GSA-negotiated prices from GSA-approved sources. Companies must upload their pricelist to GSA Advantage! after the contract is awarded and also update GSA Advantage! after each contract modification (such as a price change, product addition or deletion) is awarded. 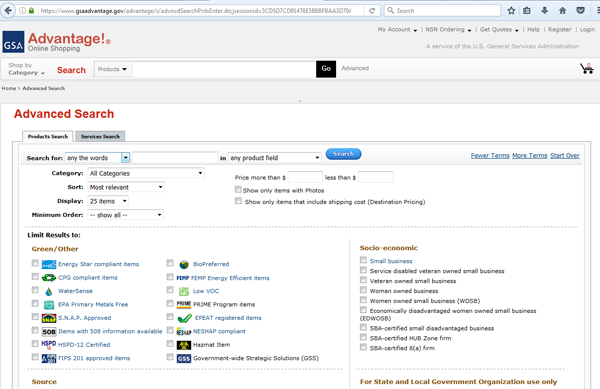 State and local government entities can also use GSA Advantage! to purchase products and services under both the Cooperative Purchasing Program and the Disaster Recovery Purchasing Program. Are you frustrated with the SIP program? BH Sky provides complete GSA Advantage! text and catalog upload services, including product descriptions, pricing and multiple photo files. We have a simple EDI upload system that is easier to use than SIP. BH Sky combines your SIP files (iprod, iprice and iphoto) into one master spreadsheet. We save you time and money by uploading your contract terms, conditions, spreadsheets, and photos quickly and accurately to GSA Advantage!. We help you stay compliant with contract requirements so that you can take full advantage of your contract. Is your contact information current on GSA eLibrary? Is your socio-economic status correct on GSA eLibrary? GSA eLibrary is the one source Federal agencies use for the latest GSA Schedule Contract listing, Schedules information, Special Item Numbers (SINs) and contract award information. Check if your contact information, text files and socio-economic status is current so that potential government customers can easily reach you. GSA eLibrary is also a powerful market research tool used to identify the name and number of competitive vendors and their respective business size by schedule and SIN. This information can be used to analyze market opportunities and potential subcontracting opportunities. BH Sky updates information for its clients on the GSA eLibrary Contractor Information page including their address, phone, e-mail, web address, socio-economic status, T&Cs/ Pricelist (text file), socio-economic status, election to participate in Disaster Purchasing and/or Cooperative Purchasing, and GSA Advantage! catalog information. Some of the information may require a contract modification followed by the update to GSA eLibrary and GSA Advantage! BH Sky can prepare, upload, and submit your contract modification via GSA eMod. We work with your Contract Specialist (CS) or Contracting Officer (CO) to answer contract related questions and ensure your modification gets completed in an expeditious manner. BH Sky provides complete GSA Advantage! text and catalog upload services!